In the summer 2014, each product team at MeYou Health was preparing for an open house with the board of directors. Bill Sabram was asked to sketch the story of the Daily Challenge randomized clinical trial (RCT). Bill created a whimsical and informative visual journey, like a Rube Goldberg machine, to tell this complex tale. He scanned the final version into the computer, and then projected it onto a 6 foot by 4 foot whiteboard. This whiteboard illustration was a big success. In fact, after the open house, no one wanted to erase it! 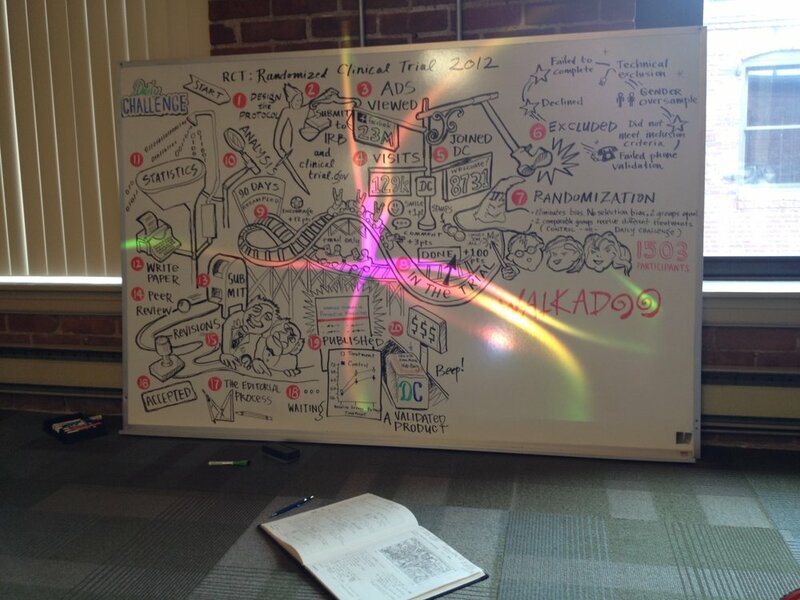 Bill’s RCT whiteboard sketch became a cherished learning tool in the office, greeting visitors and educating viewers on the 20 steps that MeYou Health took to conduct a successful randomized clinical trial for Daily Challenge.